Family Fun Across New York City! Summer in New York City is fun! There are so many things that you can do with the family. Picnics in the park, Broadway shows, Bryant Park movies...what about something that is both fun and educational? Since December of 2016, TopView Buses have provided double decker bus tours all over New York City complete with audio guides that explain NYC architecture and history in eight languages! Not only does the family get amazing views all over the city, on it's open air second level they get to learn all about the history of New York and it's unique buildings! yet explored! 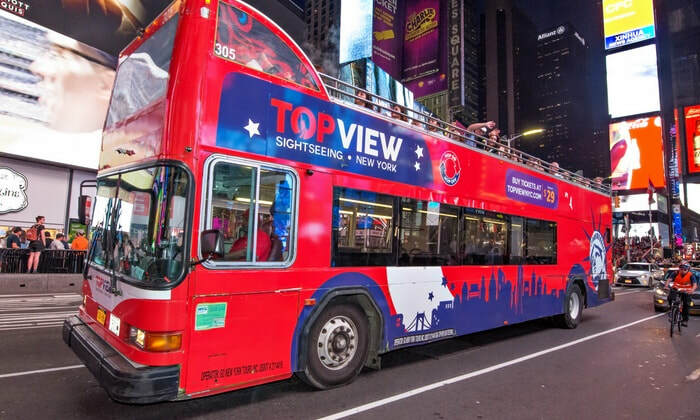 The best part of riding on a TopView Bus is that you can hop on or off near 40+ major attractions all over New York City! If you and your family are not big fans of hopping off you can also stay on board and get fabulous views all over the city! ​There are 5 routes to choose from so you and your family can explore every part of New York City from Brooklyn to the Bronx! Some additional perks for most tickets include a free Liberty Cruise to see the Statue of Liberty up close, ​free bike rental and admission to Museum of the City of NY. Tickets start at just $25.00 and are definitely a great way to spend a Summer day out with the family!